Real Madrid could be set for a new managerial direction if reports emanating Spain are anything to go by. The Los Blancos have endured a torrid season so far, which has seen the club struggle to match up to their rivals both domestically and in Europe. In the space of a week, Real Madrid have seen their La Liga hopes blown away after successive losses to Girona and Barcelona. The Blancos were also knocked out of the Copa del Rey semi-final after losing again to the Catalan giants. The biggest blow of all came in the UEFA Champions League, where Real Madrid threw away a 2-1 first-leg lead to lose 4-1 at the Bernabeu to Ajax – a result that ended the club’s hopes of making it four successive triumphs in Europe. 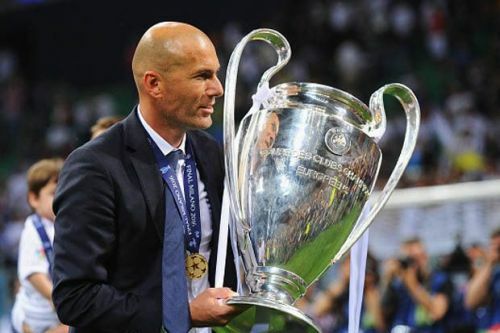 So far, there have been speculations surrounding manager Santiago Solari’s future, but the reports of Zinedine Zidane becoming Madrid’s new manager have become rife on Monday. European football expert Guillem Balague broke the news, via the BBC, that the Frenchman will officially replace Solari tomorrow. Although Real Madrid are yet to make any statements on the said appointment, many other credible portals have reported the story, including Sky Sports. Zidane was Madrid manager for two and a half years, helping the club to numerous trophies. The Blancos legend led the club to an unprecedented three Champions League titles, as well as La Liga and the Copa del Rey. The 46-year-old, however, followed Cristiano Ronaldo out of the Bernabeu exit door at the end of last season. Zidane had initially been linked with a move to Manchester United, but Ole Gunnar Solskjaer’s transformation of the Old Trafford outfit appears to have put the move on hold. Meanwhile, Twitter has gone wild over the reports that Zidane will be announced Real Madrid manager tomorrow. BREAKING: Zinedine Zidane ‘to make sensational Real Madrid return’.